Club Mina Jumeirah Dubai at Le Méridien Mina Seyahi is known for facilitating the citizens and tourists of Dubai with numerous activities based on water sports. Banana Boating is one of the most admired service of Club Mina Jumeirah Dubai, this is the reason why people visiting here prefer experiencing the thrill and excitement in this water sport. The activity is arranged under the supervision of life guards so that people consider the environment completely secure and enjoy their time. Usually on weekends visitors prefer coming here and enjoy some quality time with their family and friends. If you wish to acquire further information related to this exotic location then this guide deserves a look. - Club Mina consists of five pools along with a 500 meters long beach. - Gyms, sauna and volley ball courts make this place worth visiting. - Along with other water sports, banana boating facilities are also being granted. Dhs 50 per person is charged for 15 minutes. 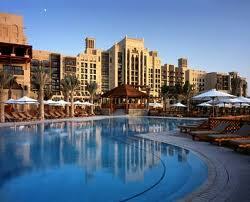 All seven days a week Club Mina Jumeirah Dubai endows its water sports facilitates during 9:00 am till 7:00 pm. Royal Mirage Hotel 2 2, the nearest bus stop from Club Mina Jumeirah Dubai only allows route number 8 from Gold Souq Bus Station 2A to make a stop. If you choose bus in order to reach at the Club Mina Jumeirah Dubai then head in the southwest direction on the Al Sufouh Rd D94. On the same road, take a right turn and then a left turn after covering 12 meters. Before reaching at your destination take a right turn and then the last left turn. 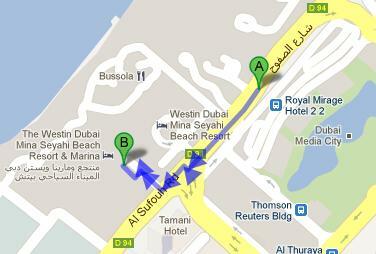 Total 6 minutes walk is required to cover 450 meters distance between the two locations.